SolarWorks NJ, LLC, one of the oldest solar installers in New Jersey, with proven expertise in designing, building, and managing small and large-scale renewable energy solar projects, is proud to announce they are beginning construction with Robert Haas at B&G Properties LLC in Southampton, NJ. SolarWorks NJ will be installing a 47.94 kW solar energy system offsetting two meters at the property. The solar array will produce over 59,159 kilowatt hours annually, offsetting a majority of building’s electric usage and cost. 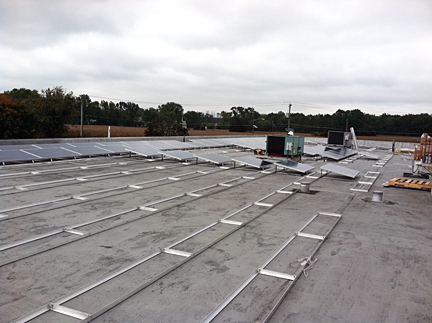 A total of 204 Trina 235 Watt modules will be installed on the roof, as well as SMA Sunny Boy inverters with web monitoring capability, and Unirac’s Rapid Rac ballasted racking system. B&G Properties owner, Robert Hass, will receive a 30% Federal Energy Grant from the United States Treasury Department to help finance the system cost. Construction will be complete by the end of October. After local and state inspections have been completed, and final utility interconnection approval has been granted, B&G Properties will be a “green company,” producing clean, renewable energy.